The DMC Heavy Duty Padlock is the prefect seal for applications requiring a seal that can withstand harsh treatment. The HD Padlock can be applied by hand but will require bolt cutters for removal. Designed for use on Railcars, Truck Trailers, Hoppers, Electrical Boxes, and Control Cabinets. 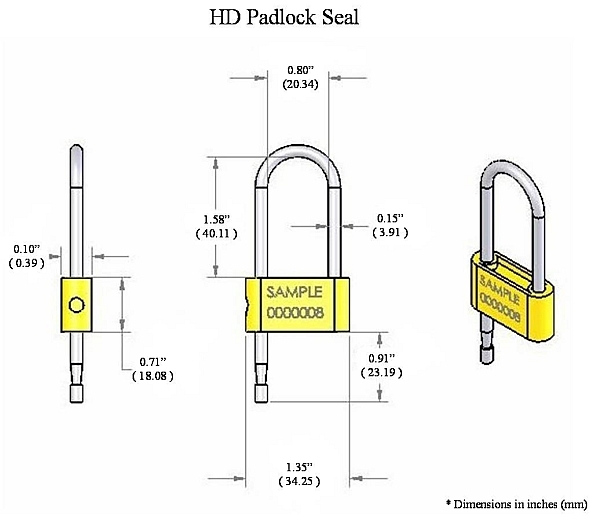 The HD Padlock is also an excellect choice for Lock Out - Tag Out (LOTO) programs. The added strength makes accidental removal unlikely and allows a safe workenvironment of maitainence employees. The HD Padlock is packaged 100/bag, 1000/box.